The Crowne Plaza Hotel - Seattle offers a superb location in Downtown Seattle, close to the waterfront and everything great in the Pacific Northwest. Just a few blocks from the hotel you can explore the historic Pike Place Market or the new Seattle Central Library; catch a Mariners game at Safeco Field or a Seahawks game at Qwest Field in Pioneer Square. Regatta Grille offers an array of tantalizing fresh seafood, local produce and prime meats. The Crowne Plaza Hotel - Seattle puts you in the heart of the city's amazing arts scene, including the beautiful 5th Avenue and Paramount Theatres, Seattle Art Museum, and Benaroya Hall. The Space Needle stands just minutes away, casting its long shadow over Key Arena, the Pacific Science Center, the Experience Music Project and McCaw Hall, home of the Seattle Opera and the Pacific Northwest Ballet. 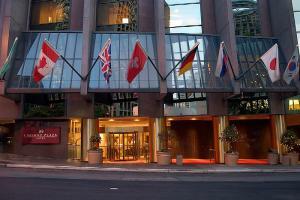 Plus, the Crowne Plaza Hotel - Seattle is just four miles from the University of Washington.